Parang kahapon lang when I gave birth to him, I close my eyes and the joy I felt the first time I saw our little angel is the same joy I have every waking morning seeing Vierte sleeping by my side. Tomorrow our little man will turn 1! We’ll have a merienda party at home and a big party on the 26th. He’s now all over the place. Crawls’ a lot and would sometimes take a few step to pickUp a toy. Pretends to read pointing to pictures on his books. Love’s to eat table food especially sinigang and dinuguan. Eat’s like he’s got some teeth when he’s got not even one. Claps his hand and sways when he likes the music. Knows very well how to make lambing when he’s done something mommy doesn’t approve of. Calls out “dada” when a phone rings. When somebody says “tara labas tayo” he would raise both his arms to that person. When asked how old he is, he would signal 1 in his hand. Give’s out a handsome grin when we sing Happy Birthday. When he hears the cat purr he would say “ohh mama.” Adores our neighbors dalmatian even if its not fond of him. He’s morning isn’t complete without seeing this boy selling pandesal. He likes playing with his balls. Prefers book and playtime over TV. He doesnt’ know any cartoon character. Rubs his nose on my face when he’s the first to wake up. 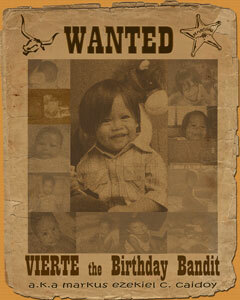 oh parang ang tagal ko ng di napunta dito, vierte is now one year old! happy bday!re: no teeth. ang cute naman, parang he’s still a baby kahit one na sya, louna had a lot of teeth already when she turned one kasi..
wow… time flew fast! Yes, parang kahapon lang na baby pa si Vierte – I still remember reading some of your blog posts when he was a tiny baby! Look at him now – one already! wow!